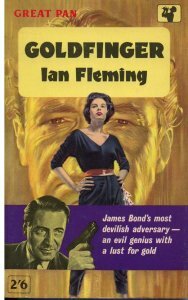 1961 Pan Books edition of Ian Fleming's James Bond novel Goldfinger. Artist Sam Peffer's model for James Bond at the bottom was Pan's managing director of the time Ralph Vernon-Hunt. Pan Books began as an independent publisher, established in 1944 by Alan Bott, previously known for his memoirs of his experiences as a flying ace in the First World War. The Pan Books logo, showing the ancient Greek god Pan playing pan-pipes, was designed by Mervyn Peake. A few years after it was founded, Pan Books was bought out by a consortium of several publishing houses, including Macmillan, Collins, Heinemann, and, briefly, Hodder & Stoughton. It became wholly owned by Macmillan in 1987. Pan specialised in publishing paperback fiction and, along with Penguin Books, was one of the first popular publishers of this format in the UK. A large number of popular authors saw their works given paperback publication through Pan, including Ian Fleming, whose James Bond series first appeared in paperback in the UK as Pan titles. So too did Leslie Charteris's books about The Saint, Peter O'Donnell's Modesty Blaise, and novels by Georgette Heyer, Neville Shute, John Steinbeck, Josephine Tey and Arthur Upfield. Pan also published paperback editions of works by classic authors such as Jane Austen and Charles Dickens. Another notable title was The Hitchhiker's Guide to the Galaxy by Douglas Adams. During the 1950s and 1960s Pan Books editions were noted for their colourful covers, which have made many of them collectables, particularly the Fleming and Charteris novels. The Pan imprint continues to publish a broad list of popular fiction and non-fiction. Among its current authors are Ken Follett, Kate Morton, Jeffrey Archer, Peter James, David Baldacci, Joanna Trollope, C.J. Sansom, Scott Turow and Danielle Steel. ^ "Contact us". Pan Macmillan Australia. Retrieved 2017-12-27. ^ "Pan Macmillan India". Retrieved 2017-12-27. ^ The Art of Sam Peffer, mi6-hq.com. Retrieved 13 October 2017. ^ Alan Bott MC 1893–1952, tikit.net. Retrieved 13 October 2017. ^ a b "Pan Macmillan Imprint History". Archived from the original on 9 July 2011. ^ a b The First Twenty Five Years of PAN Paperback Books: 1945 to 1970, tikit.net. Retrieved 13 October 2017.